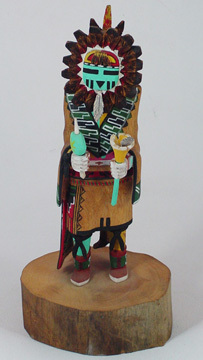 One of the functions of this Kachina is to bring the cold. 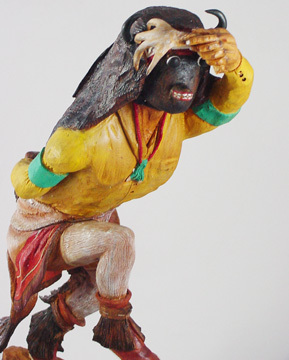 He also serves the overall function of prayers for good health, good crops, and a good harvest. 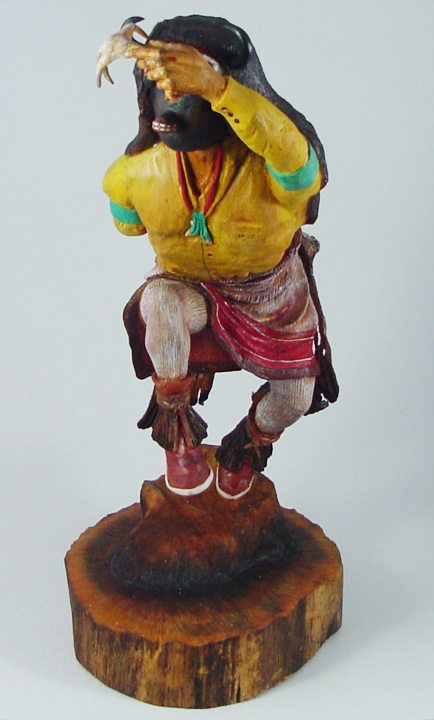 This kachina appears most frequently in the winter months, at the beginning of the Kachina season. 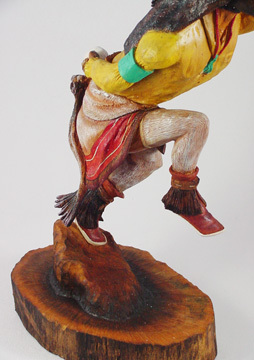 He has been known to dance in the night Kachina dances in the kivas primarily, yet he has also been known to appear in plaza dances with the mixed Kachinas. He usually carries a lightning stick and a rattle with stars painted on it. 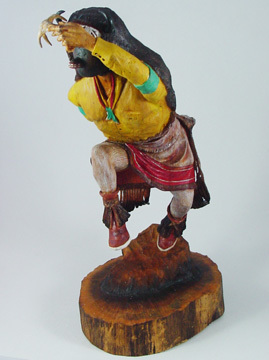 He is a contemporary kachina. 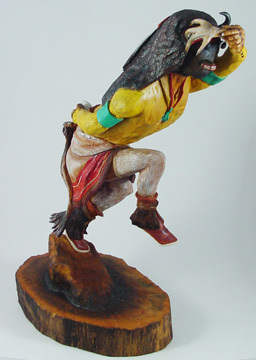 Known as the Cold Weather Man; he comes to help with/for a good hunt; at Oraibi, he wears white leggings; at Shungopavi, he wears yellow leggings and requires a shirt. 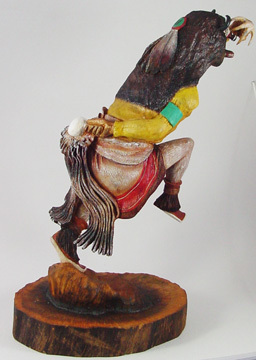 Ros George is another prolific kachina carver whose work can be found in only the most discriminating collections. 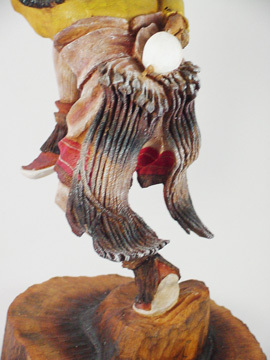 As an award-winning carver, he focuses primarily on pieces for his shows and a long list of buyers from around the world. 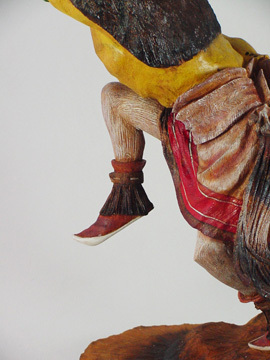 Ros is featured in "Hopi Kachina Dolls and their Carvers" by Theda Bassman. His story is a compelling one. 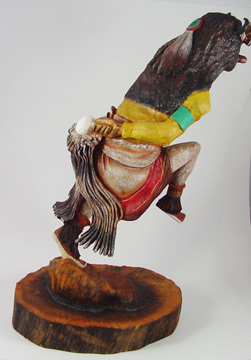 He started with animal figures, but has become well known for his many other creations, including the incredible buffalo Kachina - as presented here. Ros took on his father's name, preffering it over his given name, Amos, after his father passed. He signs "Geo." or "George." 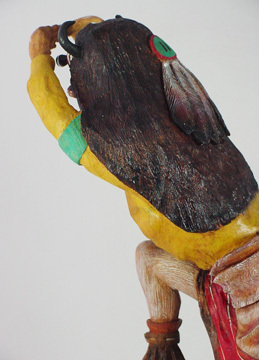 Here, the Buffalo leans forward shielding his eyes. The rendition of motion is extraordinary! It seems as if the figure is taking off!